HONG KONG—In the aftermath of this fall’s pro-democracy protests, Hong Kong university students are looking to resist communist penetration of their student bodies. Exhibit A in this trend is the controversy over the candidacy of mainland Chinese student Ye Lushan for a cabinet secretary position in the Hong Kong University Student Union (HKUSU). Ye comes from Guangzhou, the provincial capital of Guangdong Province, which is just north of Hong Kong. She studied at the prestigious Affiliated High School of South China Normal University. When asked how she viewed the Chinese Communist Party (CCP), she noted that the CCP is China’s ruling body and then said, “One can see its accomplishments, anything that is not done adequately can be criticized and the CCP has corrected them.” Ye claimed she opposed the CCP’s interfering with the affairs of Hong Kong. Ye also said she was once a member of the Union of Students For External Exploration (USEE), an organization established by students from mainland China that specially organizes events for the mainland students. Ye said she only “assisted” in organizing events. In 2014, USEE organized a new student orientation event and invited a special guest speaker, Wang Yaoying. Wang is the founder of the Hong Kong Tertiary Student Alliance (HKTSA), a pro-CCP organization. Wang is also a member of the All-China Youth Federation Committee, a branch of the Communist Youth League. He has held important positions as a part-time consultant for China’s Central Policy Unit and chief executive officer of the Basic Law Institute. The past penetration of communists in positions of responsibility at HKU involved HKTSA members, such as Chen Yie, Chen Guankang, Chen Xianlong, Huang Borong, and Mei Yixi. 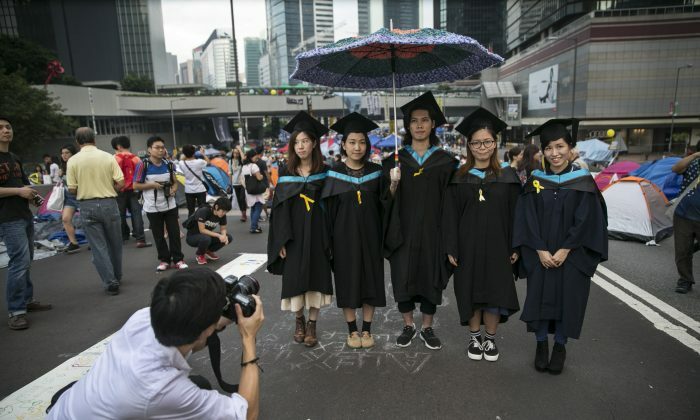 That organization is suspected by some students of being used by the CCP to strengthen control of Hong Kong’s tertiary education sector by taking over the student unions. Ye has since published an article to rebut the claims made by HKU campus TV that she was sent to “red-dye” the HKUSU. In response HKU campus TV said it has the responsibility to investigate every candidate’s background so that students could know them better. The TV station also said it was not targeting Ye personally. Another candidate, Feng Jingen, who is running for president of the “Ming Feng” cabinet, was asked to provide his family’s political background. Ming admitted that his grandfather was a senior official of the CCP. On Friday Feb. 6, The Global Times, an English-language publication of the CCP mouthpiece People’s Daily, published a signed article criticizing the controversy over mainland Chinese students running for the HKUSU, saying it has brought “McCarthyism” into the school campus. If the ideology is that of the CCP, then it is inevitable that its way of doing or looking at things would be brought in. As to The Global Times’ backing of Ye, Chen said, “I think [in terms of] what the CCP said, it needs to evaluate why the people of Hong Kong are so sensitive toward communism. The CCP has done many things that violate human rights and suppress democracy, so that is why everyone has doubts. Chen pointed out that the CCP has committed unspeakable crimes against humanity. Since the CCP was established in 1949, it has killed tens of millions of Chinese people, from the Great Cultural Revolution, to the Tiananmen Massacre, and the persecution of Falun Gong. Noting that in Washington, D.C., and in Eastern Europe there are monuments for the victims of communism, Chen expressed the hope that Hong Kong can also have the opportunity to set up a monument for victims of communism so that people can be reminded of history. Tim Lan, a junior at HKU, said he would definitely not vote for a candidate with a CYL background. Lan emphasized that he was not targeting her personally, but rather the CCP. He thought that especially after the Umbrella Movement’s pro-democracy protests and with the CCP’s suppression of democracy in Hong Kong, students at HKU were more clear headed and opposed communism. A HKU alumna, Ingrid said, “It is very normal for any organization that is affiliated with the CCP to be unwelcomed in a free country. The CCP recruits elite students by adding points to their school entrance exams and helping them find good jobs. To people living in a normal society and a free country, joining the CCP is similar to having joined the Nazis. Ingrid said that even though many mainland Chinese people go to Hong Kong one cannot rule out that there are those who do so who work for the CCP. But the majority of them move to Hong Kong because it is a free land, with freedom of education, different policies, fair opportunities, and professors with character, and a place where they can truly understand common values and explore the truth. The controversy swirling around Ye Lushan’s candidacy has been anticipated by other events in the past few years. In 2011, students with CCP backgrounds were running for cabinet positions at City University of Hong Kong (City U) and Lingnan University (LU). Liao Weiyi, the president of LU’s only cabinet of the session, publicly admitted that he was a member of the CCP, shocking the school campus. Other cabinet members called for students to vote against his cabinet or cast blank votes so it would lose the election. As a result, the number of votes was far below the legally required number and those who voted with no confidence accounted for 82 percent, which successfully made him lose the election. A scholar pointed out that for Liao to proactively announce in public his membership in the CCP was not normal. With the CCP penetrating deeper in Hong Kong school campuses, the incident likely suggests that the CCP was testing the waters and trying to gauge the Hong Kong people’s views. In the same year, members of the three candidate cabinets of City U Student Union were identified as CYL members. The No. 1 cabinet “BaiHui Cheng Chuan” had as many as 4 students from mainland China who were members of the CYL. “BaiHui Cheng Chuan” later drew a clear line, reapplied for a cabinet position with no political background, supported a redress of the Tiananmen Massacre, and called for implementation of dual universal suffrage as soon as possible. The vice-council of this cabinet, along with another cabinet member, later publicly renounced the Communist Youth League and Young Pioneers. In 2013, the HKUSU election again revealed a wave of communism. On the evening of Feb. 6, more than 1,000 HKU students gathered to protest against an election that was taking place in a black box. They suspected that the HKUSU was “red-dyed” and asked Chen Guankang, the president of HKUSU, to step down. Many members of the HKUSUS that year were exposed for having close relationships with Hong Kong Tertiary Student Alliance (HKTSA), a pro-Beijing and red student organization.